As our longtime readers are aware, WWR’s mission is all about covering the great affordable watches that are out there. In that arena, there are brands that immediately come to mind, and then there are others that are dismissed over overlooked. I’m not sure which camp you, dear reader, put Orient into, but they are definitely making solid watches at nice price points. While they’ve got plenty of popular models in their lineup, they’re now introducing some new ones. 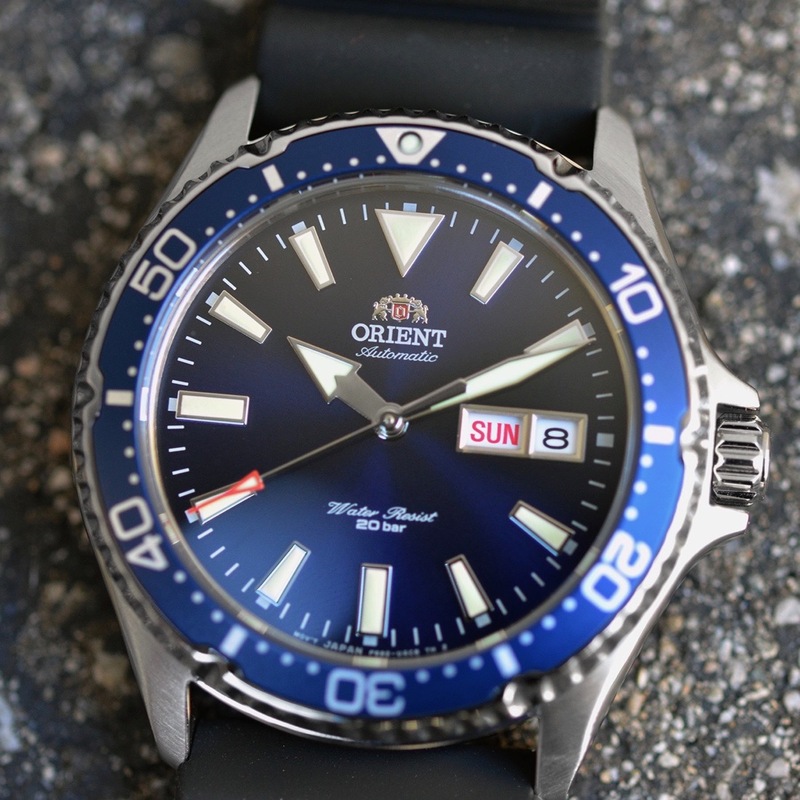 Just last week they unveiled the Orient Kamasu, their newest dive watch. What is a kamasu, you ask? Well, apparently (as I don’t speak Japanese) it is the Japanese word for barracuda. And yes, I’ve now got that song stuck in my head, complete with galloping guitar line. But I digress – I like that song, and I think something like a barracuda is a great name to tie to a dive watch. Translating it into another language, well, that makes things a bit more subtle. And, with the Orient Kamasu coming in at 41.8mm and just 12.8mm thick, it is indeed subtle, as far as dive watch dimensions go. In terms of the styling on the Orient Kamasu, I’d say it’s classic. You’ve got broad and lumed inidices complimenting the handset, which themselves make it plain which hand is which. In fact, the arrow-ish hour hand certainly is a nod to those divers of the 60s, updated for today. You’ve got the flatter dial giving things a monochromatic look (with one exception, more on that in a bit) which keeps things legible. One might wish for color-matched discs for the day and date, but they’re keeping in line with the contrast presented by the indices, so it’s not off-base. So, as I mentioned, this model lineup is mostly monochromatic (with black, blue, red, or teal dials). There are two variations that bring gold into the mix. The first is a little more expected, with a black dial showing up where the hands and indices are surrounded in gold tone, and the bezel shows up in gold as well. The one that particularly grabbed my eye is the old blue-and-gold. Well, unlike that Cub Scout awards banquet of the past, this one features rose gold. This is the gold tone that I prefer, if I’m doing any sort of golden tone. On this model, the rose gold appears just on the bezel and the handset, and that allows you to see the very special dial. While the product page doesn’t specify, I’ve asked the brand and the answer is “shell”, which sounds to be like abalone, but I suppose it could be something else entirely.